The worlds first magnetic softbox. 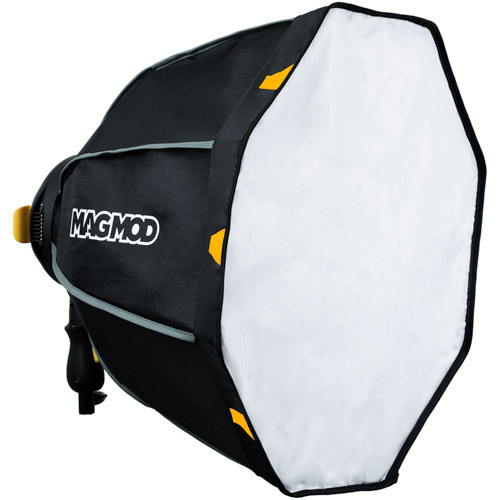 The MagBox, combined with the MagBox FocusDiffuser is the brightest softbox ever. The MagBox is the first gellable softbox. The MagBox not only features two unique types of diffusers, but integrates seamlessly with both studio strobes and speedlite flashes. 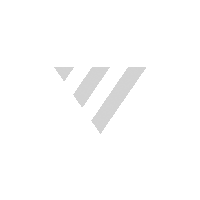 The MagBox, MagRing and MagShoe help you work smarter, better and faster so you can focus on doing your thing: creating awesome images and impressing your clients. So go ahead and try new techniques - even under busy shooting conditions. Changing your lighting on the fly has never been simpler. Creating soft light with speedlights or strobes just got way easier. MagMod created a whole new way to modify your light, and it’s called the FocusDiffuser. The FocusDiffuser acts like grid and a lens combined, allowing you to control light spill and increase the effective light output. Just want soft light? Use the Fabric Diffuser. Embedded magnets in both diffusers make attaching them to your MagBox fast and easy. Forget taping flimsy gel sheets to the outside of your softbox. MagMod's rigid gels snap right into a built-in gel holder. You don’t even have to remove your diffuser to change gels! Use the MagBox's handy side zipper to access gels. 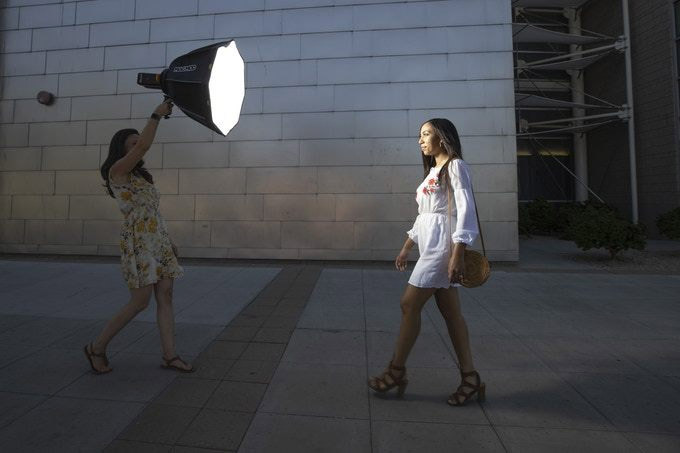 The MagBox is the most versatile softbox ever, making it one super smart investment. 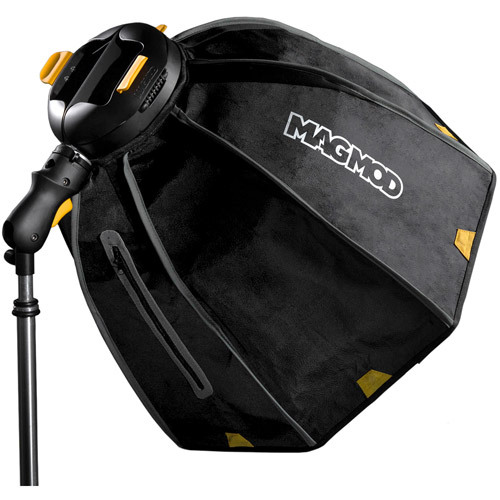 Use the MagBox with 1 or 2 speedlights—any flash that has patented MagGrip installed will work. Or use one of the available adapters to mount your Profoto, Bowens, Elinchrom or Paul C. Buff strobe. The Easiest Dual Flash Mount, Ever. Designed to work seamlessly with the MagBox and MagShoe, the MagRing is a dual flash mount that makes attaching larger modifiers to smaller hot-shoe flashes super simple. The MagRing is rock-solid. With your flashes magnetically mounted in the ring, close the beefy security doors to lock ‘em in place. You spent a lot of money on your flash; protect your investment from kissing the pavement or getting lost in the ocean by locking it up securely in the MagRing. Just pop any flash that has a MagGrip, MagMod's patented universal flash mount, into the MagRing. Since the MagGrip works with pretty much any flash, you can use pretty much any speedlights you own inside your MagBox. Thanks to the freakishly strong neodymium magnets inside the MagGrip, speedlights attach securely to the MagRing—in literally 1 second. No special tools or locks required. The MagRing makes it easy to switch a speedlight from being on-camera to off-camera in a jiffy. MagMod made the MagRing compatible with your existing MagMod modifiers. Throw on a MagGrid, MagGel or MagSphere without having to remove your flashes from the MagRing. The MagShoe makes mounting a flash faster and easier and more comfortable than ever. Just slide in your flash and turn the lock 90°. Its ready to go. The MagShoe's sturdy lock renders that crummy, obnoxious twisty lock on your flash totally unnecessary. You'll never have to waste time with that thing ever again. Adjust the angle of your light with one hand. Just press the handy orange button to make quick, precise adjustments. In one swift motion, the MagShoe's got your flash locked down tighter than Fort Knox. Your flash won't come loose and its not going to wobble- even if you bump your stand. A silky smooth silicone coating and ergonomic grip feel like joy in your hand. Even the knobs on the MagShow were intentionally designed to fit human-sized fingers and are easy to turn.